Interviews with quirky YouTube stars. Snapchat Q&As. Appearances on Internet comedy shows. That's just a taste of where digital campaign communications could go by November 2016. 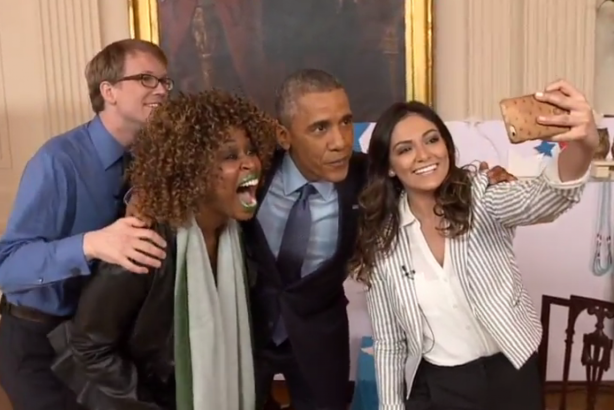 President Obama's recent interview with three YouTube stars is an example of where digital campaign communications could go by November 2016. President Barack Obama not only turned out more voters than his opponents in 2012 and 2008, he also showed superior communications on social media. Yet in 2016, candidates will embrace even riskier platforms, get across more of their personalities, and leverage big data for surgical voter targeting. So if you thought Obama’s appearance on Between Two Ferns last May was a step too far, buckle up. "The smartest candidates are going to go to edgier places," says Robert Gibbs, founding partner of The Incite Agency and former White House press secretary. "That means not only outside mainstream media, but also technically media as a whole. Candidates and even presidents understand that this is where they need to reach people." He cites his former boss’ interview with three popular bloggers and YouTube creators, which was the president’s first sit-down interview following the State of the Union address – a plum spot. The video, which featured many funny, yet awkward exchanges, has been viewed on YouTube more than 3 million times. "Candidates understand that something, which feels real and authentic, is more likely to go viral than another thing that looks like it has been polished in a lab," explains Gibbs. "I think you’ll also see far more videos that will look like they were shot on an iPhone or an unsteady hand-held camera." On the Republican side, likely presidential candidate Sen. Rand Paul (R-KY) recently did an interview through disappearing-image-driven messaging service Snapchat, talking about topics from presumed Democratic frontrunner Hillary Clinton to what he does to unwind. Bill Burton, MD of SKDKnickerbocker’s new office in Los Angeles, predicts "Snapchat and Instagram will likely be more influential than ever before because people are signing up in such large numbers." Yet Burton, deputy press secretary to Obama during his first term, predicts that social media channels that were important in past elections may find new life in the next race. "Facebook has seen its number of profiles rise and fall, but it is still such a driving force and innovative company that you have to believe it will find a way to be really engaged in the election," he says. "Forget Facebook at your own peril." Sean Spicer, communications director for the Republican National Committee, who recently added senior strategist for the 2016 campaign cycle to his title, anticipates campaigns will be more surgical in their use of social media, given the number of popular platforms. He says social media data is being crossed with voter data to help candidates pick the best channels. "We can see how one platform fits a certain voter profile, and how it might be great to talk about issues A, B, and C on one and issues D, E, and F on another," Spicer explains. He notes the RNC has invested heavily in data analytics in an effort to figure out how to use social media to build a winning campaign at the party level. "Obama had a great campaign for a candidate, but no one has figured how to transform that to the Democratic Party," Spicer asserts. "So we’ve spent the last four years trying to figure out how to create tools that will do that [for the Republican Party]." While data targeting was ever-more-precise in recent election cycles, the practice will take another quantum leap forward in 2016, he contends. "In this coming cycle, data will play a role exponential to whatever it has seen before, because we can target voters in ways they’ve never been," says Spicer. "That’s where the investment in data will pay off in spades for the RNC." Matt Simmons, VP at Ketchum, predicts that the maturation of social media will also change how candidates release information while campaigning across the country. To further foster an ongoing interactive relationship with allies, he suspects presidential hopefuls will make important announcements to supporters via social media, rather than through the traveling press corps. "If you look at Obama’s State of the Union address, the White House traditionally released excerpts from the speech about an hour or two before, but this time they put the entire speech for everyone to look at it before the Washington press corps got it," he explains. "You will see campaigns do something similar in terms of bypassing the traveling press corps." Simmons also predicts candidates will increasingly use digital tools to build their public personas, as well as to push out policy positions. He cites Clinton’s recent tweet in support of vaccinations for children. "The science is clear: The earth is round, the sky is blue, and #vaccineswork. Let's protect all our kids #GrandmothersKnowBest," it read. "Some will be better at this than others, but [Hillary] Clinton is someone you would expect who wouldn’t be comfortable in that world, but she showed a lot of personality in a little tweet," says Simmons. "It demonstrates a willingness on her part to be seen in a different way." 2016 candidates will also be expected to quickly form positions on fast-breaking news on a range of issues from ISIS and terrorism abroad to gas prices and other economic topics at home. Those that stall will be called out by the press for not acting quickly enough. Michael Feldman, founder and MD of the Glover Park Group, who served in various advisory roles to former Vice President Al Gore, says politicians will ultimately need to be opportunistic about social media, recognizing how quickly platforms can rise, fall, and change. "They’ll have to be nimble, flexible, and opportunistic, and constantly able to react to the changing communications environment around them," he explains. "The biggest challenge for everyone will be operating in a more chaotic and decentralized communications environment."